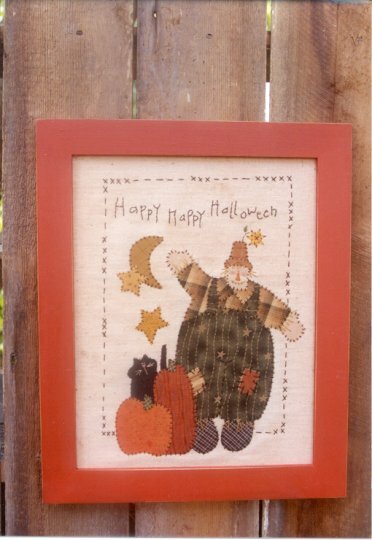 A fun Halloween stitchery pattern. A pair of old witches boots are filled with bittersweet and a punkin-headed stick. Piece is handstitched onto homespun and then stitched up into a great Halloween pillow. 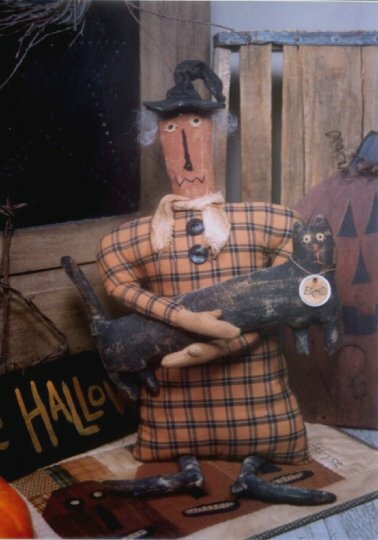 Pattern for a 20" punkin-headed witch and her cat named Fraidy. A fun new aging technique gives this doll a great time-worn look. Let this duo cast a spell this Halloween! 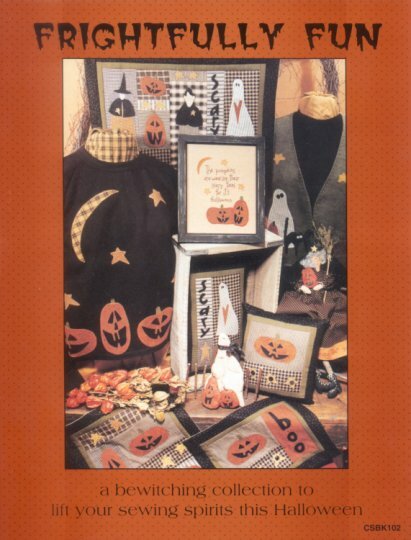 Great pattern for a 12" x 16" Halloween decoration. Old Crow and Jack are constructed from muslin that is painted, sanded, stained and then dusted with cinnamon. 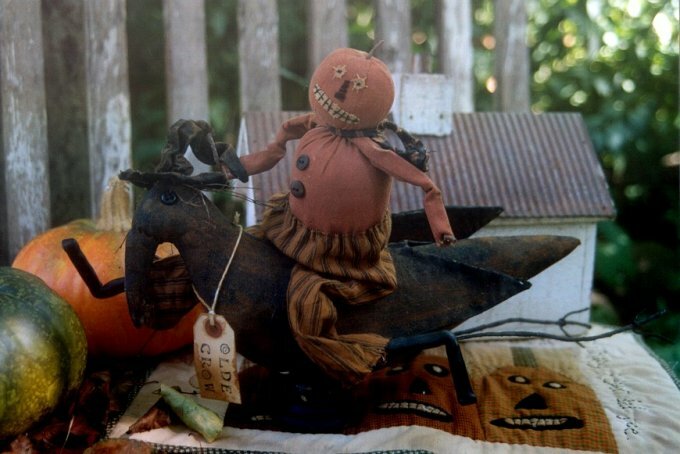 A great, whimsical piece for your Halloween decorating! 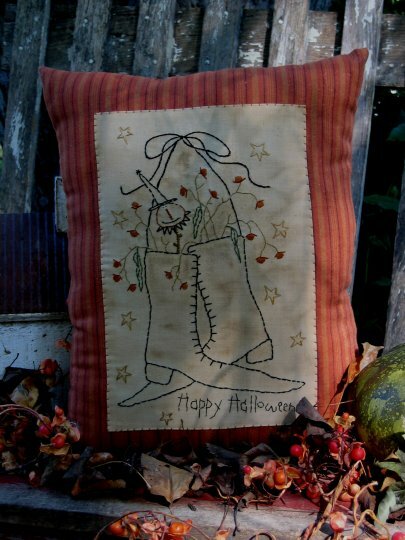 A bewitching collection to lift sewing spirits this Halloween. Booklet consists of 10 quick and easy projects. Most projects can be finished in an afternoon. 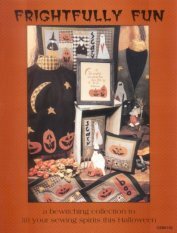 Frightfully Fun has a variety of exciting projects to choose from, be it a quilt, a witch doll, a spooky ghost or perhaps a pillow! 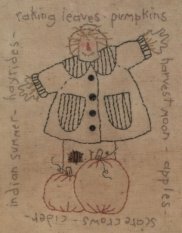 Pattern for a 7 1/2" x 13" embroidered/appliqued autumn sampler. 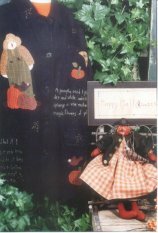 Pattern also includes a 9" scarecrow doll (not shown). 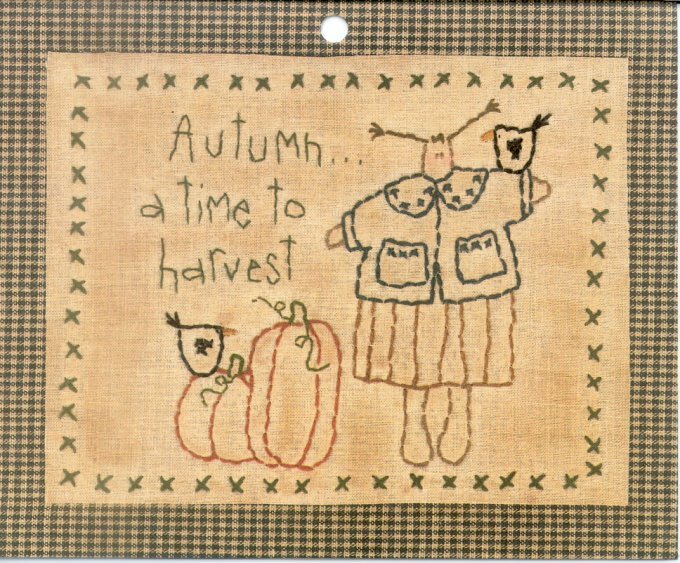 Embroidery/applique pattern for a special autumn 11" x 14" stitchery. Pattern for a 5 1/2" x 6 1/2" stitchery. 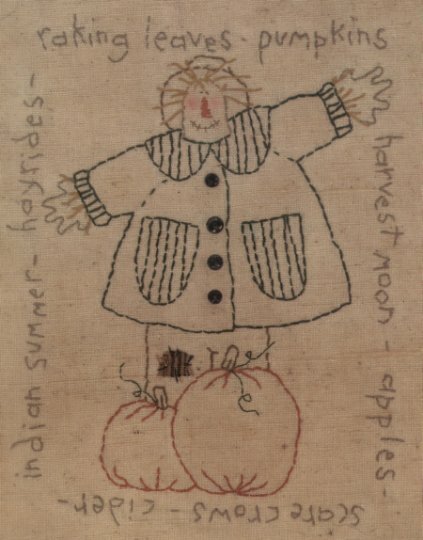 Stitch up into a pillow or put into a frame. Collect all four seasons! Pattern loaded with fun projects! 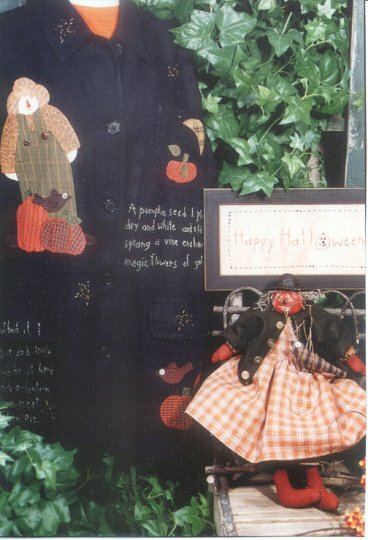 Easy applique on a purchased barn jacket, 16" pumpkin head doll and a Halloween stitchery to stitch up this Halloween. This pattern has the warm glow of fall. 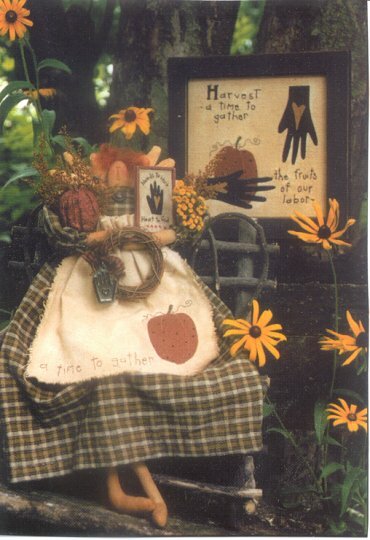 This 19" harvest doll clad with garden glove wings is showing off her fall bounty. 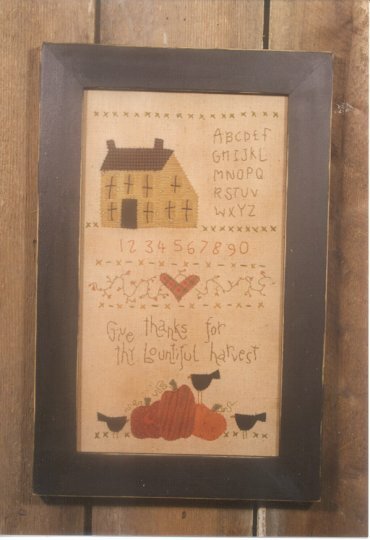 Pattern also includes a wonderful 7" x 7" embroidered picture.